Humble is free blogger template with 1 column layout, color background setting, smart thumbnail rezise and social button on homepage. Humble is a simple, clean, personal, modern and professional blog ideal for making a professional blogging and elegant websites. 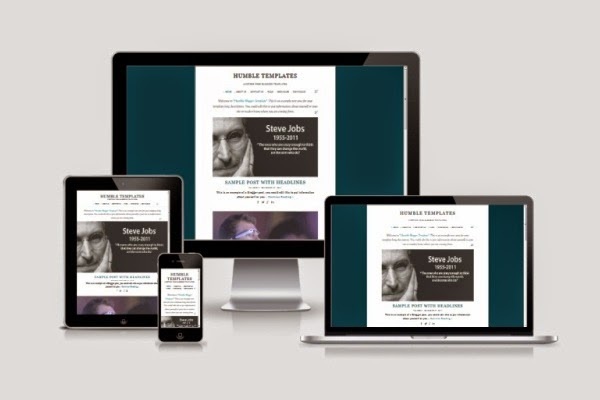 This template is totally responsive so it adapts to your style as well as the device it’s viewed on. It is clean and fresh style and high user friendly blogger template. Featured on Humble Blogger Templates including responsive design, page navigation number, 1 column layout, color background setting, comment edited, SEO ready, smart thumbnail resize and simple share social media button on homepage. Go to edit template tab and click "Customize" section. Open "Advance Tab" scroll down and find "menu text color and menu text hover" for menu navigation font color, "crosscol color" for description text color below menu navigation and "credit font color" for credit font color at the bottom of template. And than find "menu font" for menu navigation font type, "crosscol font" for description font type below menu navigation, "blockquote font" for blockquote font type inside your post, "comment font" for comment font type and "credit font" for credit link font type. Now you can download Humble Blogger Template for free only in Themes Paper, but please do not remove the credit link in the footer section. If you have question about this template, leave your comment below or you can contact us on themespaper [at] gmail.com. Thanks. Oke, silahkan mas. Semoga bermanfaat ya. Tak pasang diblog saya melalui desktop bisa muncul tampilannya seperti live preview ..
tapi kok dibuka melalui mobile tidak bisa seperti di live preview yah ?? One of my friend is looking for such kind of stunning and responsive blogger template which is simple but professional also. He is professionally an academic tutor and working with top assignment writers in UK at Quality Dissertation as well as have a dream of running blog website in which he eager to share his academic experiences along with academic writing tips with students to whom he is providing academic writing help. So I have to share with him this template, hope he will love it and apply it in current blog.